Unique installation scenarios require made-to-measure sensors. 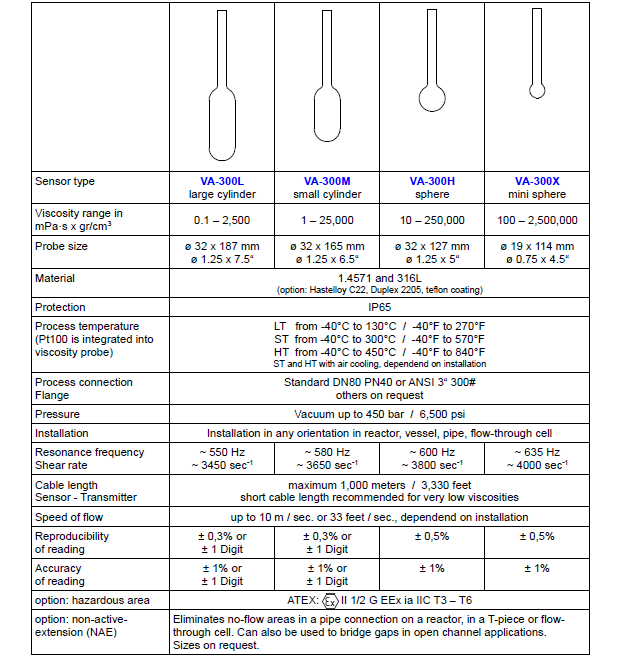 VA-300 series ViscoScope sensors can be used to realise any technically feasible design. Not every reactor has a block flange free for mounting a sensor. Frequently, only a nozzle may be available. The resulting dead volume can be bridged with a non-active extension (NAE). The length and diameter of the NAE are adapted to the dimensions of the nozzle. As a result, the medium does not collect in the dead volume and the probe is deeply immersed in the liquid being measured. It is to be installed in a pipe bend, the NAE can be adapted to the radius of the pipe to prevent obstruction of the flow. Sometimes process technology, applications or local conditions demand the design of the special	instrument. The VA-300S (special) sensor is intended for precisely these applications. If it is technically possible, it can be accomplished with this instrument.